Quiz time is back on Amazon. Amazon Recharge Quiz Answers – Win Rs 999 Prize | 20 Winners. Amazon keeps on regularly conducting quizzes to keep engaging their visitors. So, this time Amazon tried to promote its recharge category. As in this Amazon Pay Recharge Quiz, Amazon asked questions about new offers on Jio, Airtel, etc. So, just follow the steps and answer the questions to win Rs 9999 prize for 20 Winners in Amazon Pay Recharge Quiz Answers. 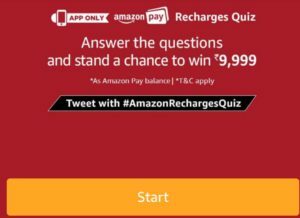 How to Give Amazon Recharge Quiz Answers – Win Rs 9999 Prize | 20 Winners? 2. Open the app and you will see a banner about the Amazon Recharge Quiz Answers. Click on it. 3. Now click on the ‘Start’ button to begin the Amazon Pay Recharge Quiz Answers. 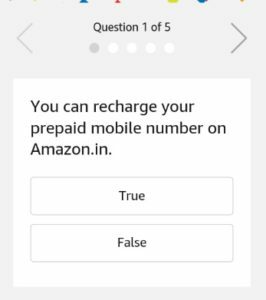 Q1) You can recharge your prepaid mobile number on Amazon.in. Q2) What is the current cashback offer for prepaid mobile recharges on Amazon.in? Q3) The cashback offer on mobile recharges is applicable on which payment methods? Q4) How long does it take for the cashback to get processed on mobile recharges? Q5) The cashback will be received in which form? 1. This Contest will commence on 12th April 2018 from 12:00:01 a.m. (IST) to 30th April 11:59:00 p.m.
6. The declared winner(s) will be eligible for winning Rs.9999 as Amazon Pay balance (hereinafter referred to as “Prize(s)”). Why post answers here , it decreases the probability of wining . This should be played fair and square.